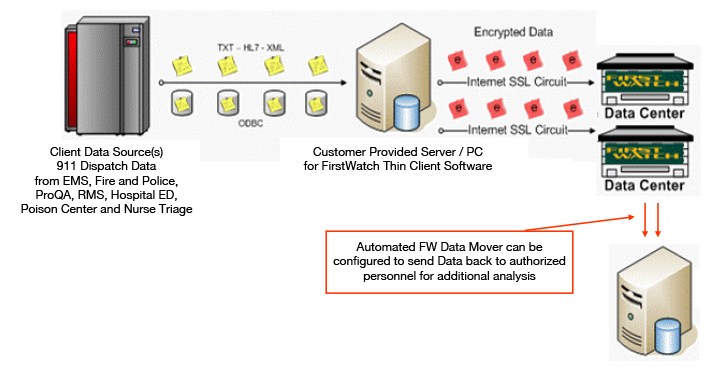 Data Mover is a general term for when we set up processes to automatically send data from FirstWatch back to a customer or stakeholder. FirstWatch brings in and combines data from many sources, and then makes that aggregated data available to customers and their stakeholders in many ways, including in our Triggers, dashboards, workspace and alerts. Usually that data is enhanced by a variety of calculations at the detailed per call/per record level (such as associating a call with the shift that was working at the time, geo-calculating specific custom geographic areas the call occurred in, determining if the call was on-time according to local rules, and even determining if detailed clinical guidelines were followed). Examples of uses for Data Mover include sending data to a customer’s local public health agency for further, ongoing analysis, or sending filtered, processed and validated records back to the customer or their vendor for their own systems to display information to the public on their website.